GitHub - feup-infolab/dendro: The Dendro platform is an "open-source Dropbox" with added description features. It is a data storage and description platform designed to help researchers and other users to describe their data files, built on Linked Open Data and ontologies. Users can use Dendro to publish data to CKAN, Zenodo, DSpace or EUDAT's B2Share and others. Want to be notified of new releases in feup-infolab/dendro? Dendro is the software powering INESC TEC and the University of Porto data staging platforms. It allows researchers to manage research data in preparation for deposit in any research data repository. "Upload files and fill in metadata once, deposit anywhere you like". Run the installation command in the same terminal and wait until no more text is printed. It can take several minutes. Access your dendro installation at 127.0.0.1:3001 in your browser. We provide a Docker image for getting you up and running quickly. For deployment in a production server, however, we recommend you use the Dendro install scripts. If you just want to download dendro and start developing, Dendro now supports automatic deployment using Docker containers for all dependencies (MySQL, Virtuoso and ElasticSearch). This only in all operating systems. Here is the "just copy and paste" installations script for Docker in Ubuntu. Enjoy. 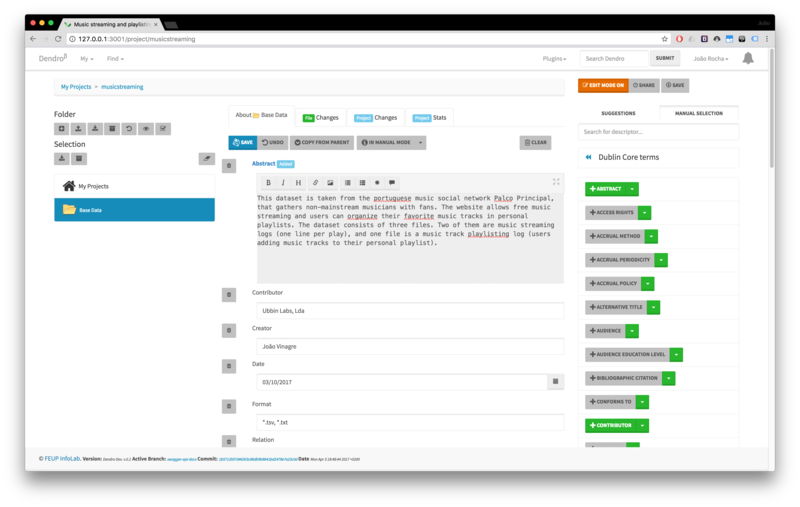 Dendro is a collaborative file storage and description platform designed to support users in collecting and describing data, with its roots in research data management. It does not intend to replace existing research data repositories, because it is placed before the moment of deposit in a data repository. You start by creating a “Project”, which is like a Dropbox shared folder. Projects can be private (completely invisible to non-colaborators), metadata-only (only metadata is visible but data is not), and public (everyone can read both data and metadata). Project members can then upload files and folders and describe those resources using domain-specific and generic metadata, so it can suit a broad spectrum of data description needs. The contents of some files that contain data (Excel, CSV, for example) is automatically extracted, as well as text from others (PDF, Word, TXT, etc) to assist discovery. Any repository can be added by writing small plug-ins. 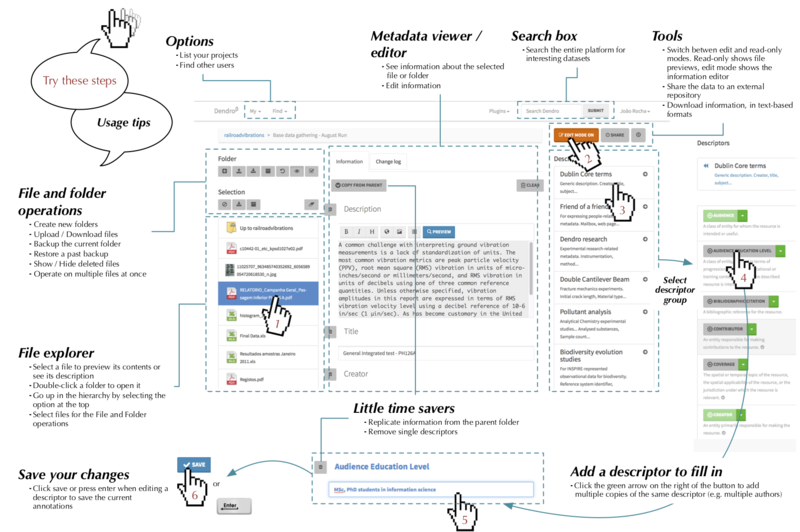 We are also implementing an altmetrics module and a soclal extension that can help project members keep track of the changes made in the project. The software will be a core component of the UPorto and INESC-TEC Research Data Management workflow by 2018 as per the TAIL project, funded by the Portuguese FCT (Fundação para a Ciência e Tecnologia). As such, we are working hard to make it production-ready. This means writing extensive automatic tests which complement the existing usage tests with actual researchers. The code is freely available online and we welcome more user testing scenarios, user feedback and development contributions. You are free to use Dendro to build any service for your research group or institution and pull requests are welcome. If it is down, please file an issue. Dendro is being built by Faculdade de Engenharia da Universidade do Porto's Infolab since 2013. 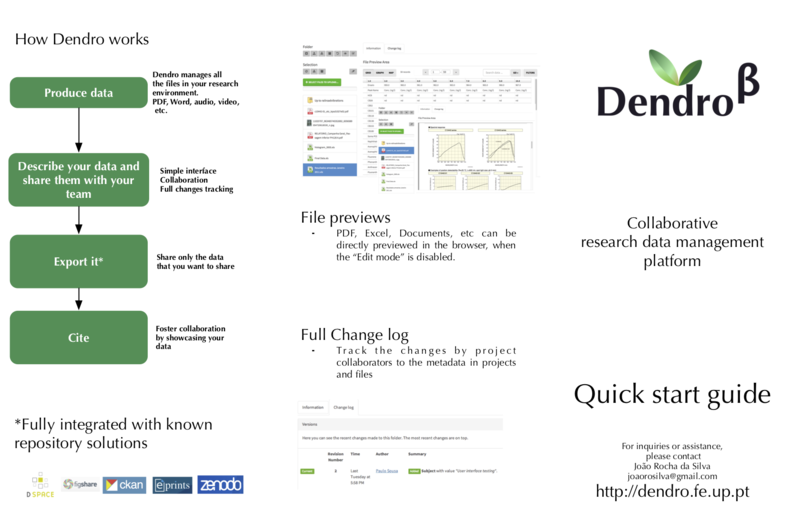 If you are interested in the academic foundations and innovations behind Dendro, please check out our publications at the Dendro official website. This work was supported by project NORTE-07-0124-FEDER-000059, financed by the North Portugal Regional Operational Programme (ON.2-O Novo Norte), under the National Strategic Reference Framework (NSRF), through the European Regional Development Fund (ERDF), and by national funds, through the Portuguese funding agency, Fundação para a Ciência e a Tecnologia (FCT). João Rocha da Silva was also supported by research grant SFRH/BD/77092/2011, provided by the Portuguese funding agency, Fundação para a Ciência e a Tecnologia (FCT). All source code is freely available under a standard BSD 3-Clause license.